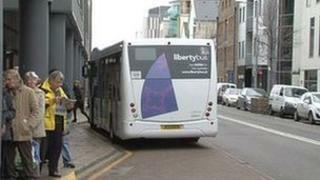 Jersey bus drivers have called off five days of strike action less than 24-hour before they were due to start. More than 60 staff had been due to walk out over working conditions and in a bid to get a sacked driver reinstated. The strike was due to be held on Thursday and Friday and from 27-30 August. Nick Corbel, Unite regional officer, said this followed progress made in further talks with the company. He said: "This was after Unite understood that the company would abide by the decision of the employment tribunal into the sacked driver's case due to be held this autumn. "We are also making productive progress on the shift patterns' issue which is the other bone of contention. We are working very hard on this to achieve a fair settlement for our members." Union members had voted, in two separate ballots, for the strike action over the unfair dismissal of two drivers, one of whom has already been reinstated, and the imposition of excessive shift patterns. Mr Corbel said "productive" talks about shifts were continuing.